LAHORE: Pakistan Muslim League-Nawaz (PML-N) on Thursday unveiled party manifesto for elections 2018. President PMLN and former chief minister Punjab Shahbaz Sharif presented the party manifesto. PMLN leaders including former prime minister Shahid Khaqan Abbasi, Azad Jammu and Kashmir Prime Minister Raja Farooq Haider and others were also present. According to the document available with The News, the PML-N manifesto 2018 encompasses the party’s vision to ensure prosperity of Pakistan. 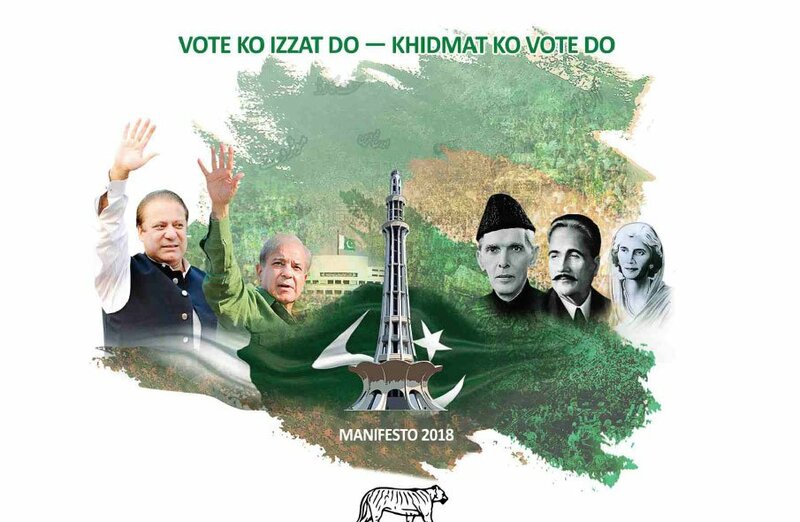 In its manifesto 2018, PML-N has promised to raise annual GDP rate, reduce budget deficit, achieve an average industrial growth, develop socio-economic zones to boost industrial production, harness the opportunity of CPEC projects to enhance access to domestic and international markets besides creating jobs for 2 million new entrants into the job market every year. The party also vows to scale-up PM’s interest free loan program, eliminate poverty by 2030, distribute millions of acres of state-owned land in 5-acre package to landless tenants, train two million people in skills required for entrepreneurship. Other promises made in the PML-N’s manifesto for elections 2018 include: providing technical and vocational training and create at least 100,000 to 200,000 jobs, launch 9 Special Economic Zones; provide farmers support packages to assist the sector’s transition into value-added crops and industrial footprint; increase the size of IT industry from $3.1 billion to $10 billion and increase jobs for IT skillers workers from 300,000 to 1 million; construct technology parks throughout Pakistan; extend technical training opportunities to 3 million people; create 200,000 apprenticeship positions for skill development in collaboration with 5,000 companies; provide stipends to school going kids of workers to ensure greated access to education; add 15,000 MWs of power by 2025 including 5000-7000 of power through Thar coal and hydroelectricity besides others.